By default, the Microsoft Exchange Online email server profile is created for Dynamics 365 (online) organizations and should be your first choice. If you want to use your own profile, you use Dynamics 365 (online), and Exchange Online, and both services are on the same tenant, use the following settings in your email server profile (Settings > Email Configuration > Email Server Profiles). By default, Microsoft Dynamics 365 doesn’t allow users to enter their email address or password when it detects that the credentials may be transmitted over a non-secure channel, such as HTTP. 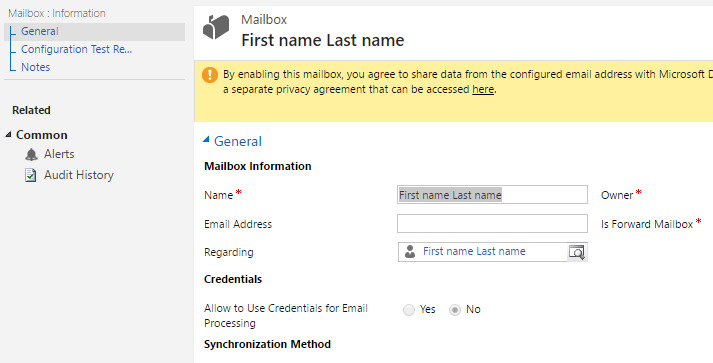 Dynamics 365 enforces this by disabling the ability to select “Yes” next to “Allow to Use Credentials for Email Processing” on the user mailbox form. However, if your deployment is using SSL offloading where Dynamics 365 can’t detect the offloading, you can configure Dynamics 365 on-premises versions to allow the transmission of email credentials. This work around is only available with Microsoft Dynamics CRM 2013 and later on-premises versions.